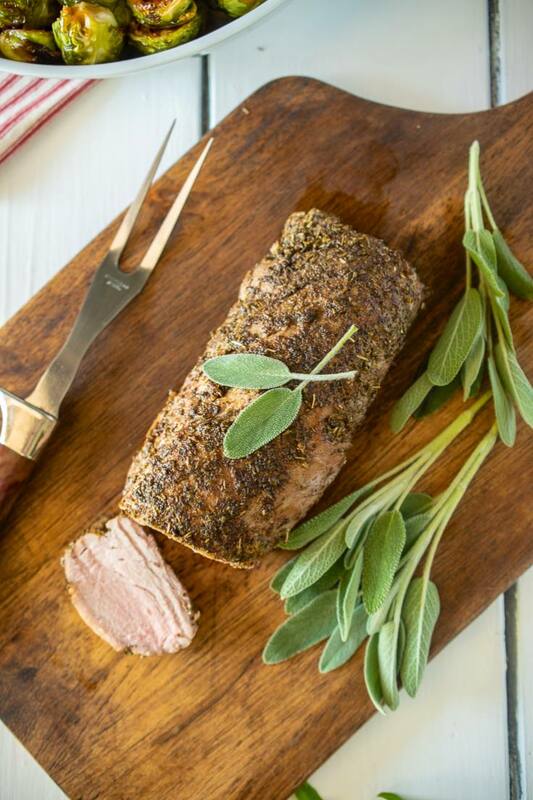 Sage Rubbed Pork Tenderloin will be your new favorite way to enjoy pork. 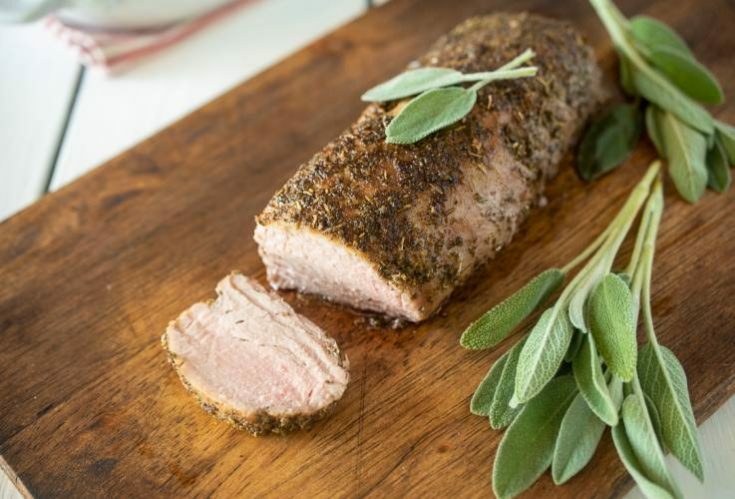 Pork tenderloin is rubbed with fresh sage and spices, then roasted to juicy perfection for a dish that your family will love for any weeknight or Sunday dinner. This is the best pork tenderloin recipe that uses a rub on the pork rather than a marinade because it cuts down on the prep time. You can come home from work and get the tenderloin into the oven in the time it takes to preheat the oven. First you will notice that a pork tenderloin in longer and thinner than a pork loin. Tenderloin has barely any fat which does best with faster cooking and the loin has a thick cap of fat on top which can hold up to longer, slower cooking. The method that has worked for me for years is to sear the tenderloin in a skillet on the stove top then finish in the oven. Searing on the stove gives the pork a delicious crust and helps seal in the juices. Tenderloin is the best cut of pork. It is the filet mignon of white meat because it is lean and roasts up really fast. How long do you cook a pork tenderloin? The best way to make sure you don’t overcook this lean cut of meat (and it’s easy to do) is to use a meat thermometer. 145°F/63°C the ideal temperature to ensure the best result. It is advisable to remove the pork from the oven at 140°F/60°C as the meat needs to rest for 10 minutes before slicing and in this time, it will continue to cook and it can quickly go from soft and juicy, to dry and tough. I have to say that I think sage is my favorite herb. Of course in the summer, I say that basil is my favorite, so apparently I change my mind with the seasons and that’s OK. In addition to sages earthy flavor, it is such a versatile herb. The seasonings are simply dried sage, garlic powder, salt and pepper. I always use fresh sage in the fall and winter, but some fresh herbs don’t hold up to high temperature cooking and sage is one of them so I use dried for this. I also always use fresh garlic, but again, when garlic is overcooked or cooked at high temperatures it can turn bitter so this is the only time I will use garlic powder. It can be roasted, fried, sautéed and goes with both savory and sweet. It’s aroma just oozes fall, but since we will be eating a rafter of birds in the coming weeks, the next best meat pairing for sage is pork. 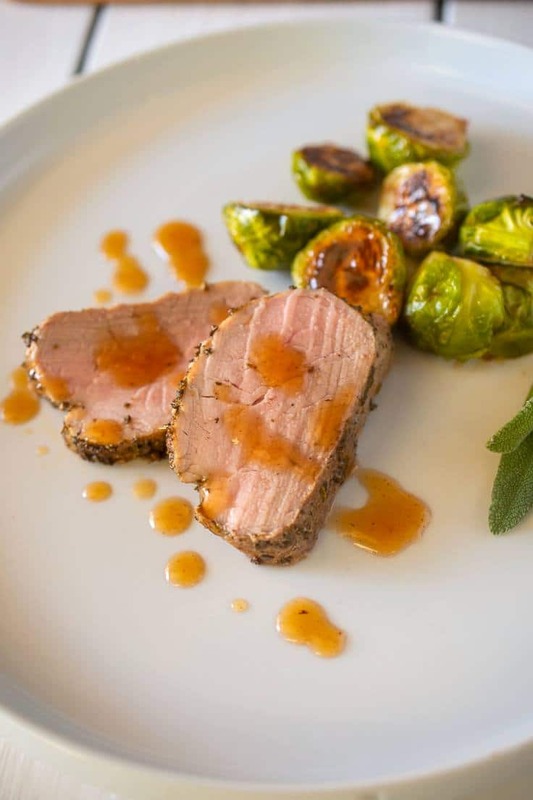 I like to serve this sage rubbed pork tenderloin with a side of roasted Brussels sprouts with cranberry glaze that is slightly sweet and tart and the glaze is also delicious on the pork. 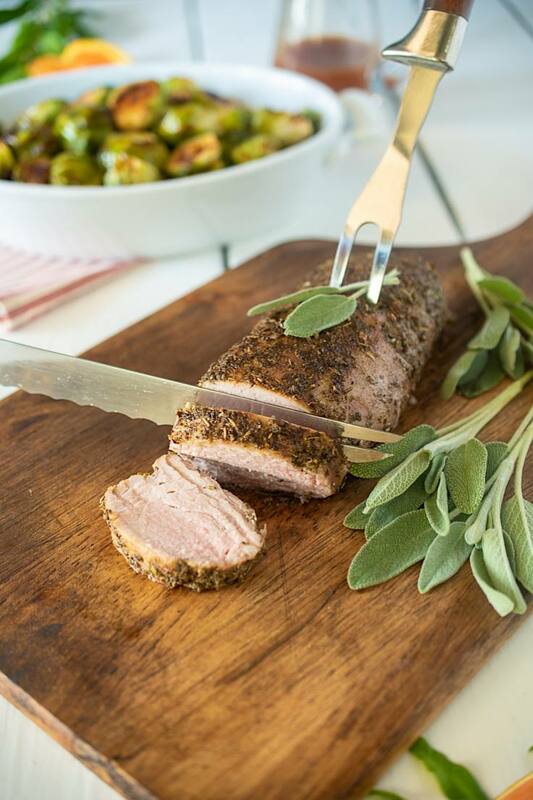 If you’ve tried this Sage Rubbed Pork Tenderloin or any other recipe on the blog then don’t forget to rate the recipe and let me know how you got on in the comments below. I love to hear from my readers! You can also FOLLOW ME on FACEBOOK, TWITTER, INSTAGRAM and PINTEREST to see daily recipe updates. 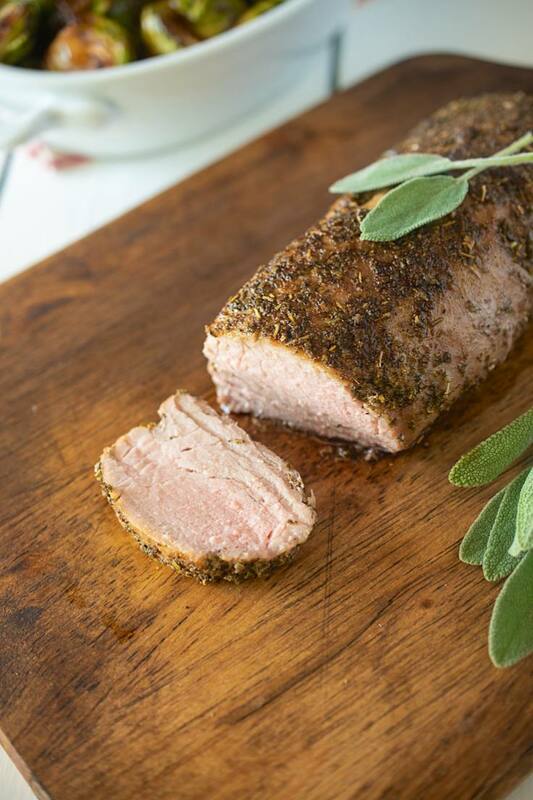 Pork tenderloin is rubbed with fresh sage, brown sugar and spices, then roasted to juicy perfection. Add the garlic powder, salt and pepper to a bowl and mix well. Drizzle the tenderloin with oil and rub all over. Sprinkle the spice mix all over the pork and rub well with hands. Preheat a large cast iron skillet or oven-proof skillet on the stove over medium-high heat for 2 minutes. Add the pork and seer on each side for 3 minutes each. Transfer the pan to the oven and roast for 15-17 minutes until a meat thermometer measures 140°F/60°C. Remove from the oven and allow the pork to rest on a cutting board 10 minutes before slicing. The pork will continue to cook when it comes out of the oven and 145°F/63°C is the final temperature it needs to reach. I bet this makes your whole house smell so delicious!! I’m definitely making this! Your pork tenderloin looks so juicy and succulent! This would be a great dish for company. And, I’m totally drawn to those sweet potatoes. They look awesome. I went to buy one of those yellow sweet potatoes last week, but my store didn’t have them. I’ll have to keep an eye out because yours looks so pretty with both kinds! This is a delicious recipe! I love the combination of flavors! This pork and the potatoes have my name written all over them! Anything with sage I adore, it is such a delicious herb. You tenderloin looks amazing!! It is recipes like this that make you very unique and talented. This looks like a very hearty meal that the whole family can enjoy. This recipe looks so good! sage rubbed tenderloin needs a place at MY dinner table! I love using sage to enhance flavors of meat. This tenderloin looks deliciously good! 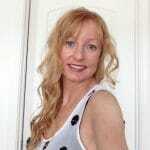 Sounds delicious Janette, I love grilling the tenderloin in the summer, will give your rub a try. Of course I do love the maple glazed sweet potatoes also, it’s my family’s favorite. 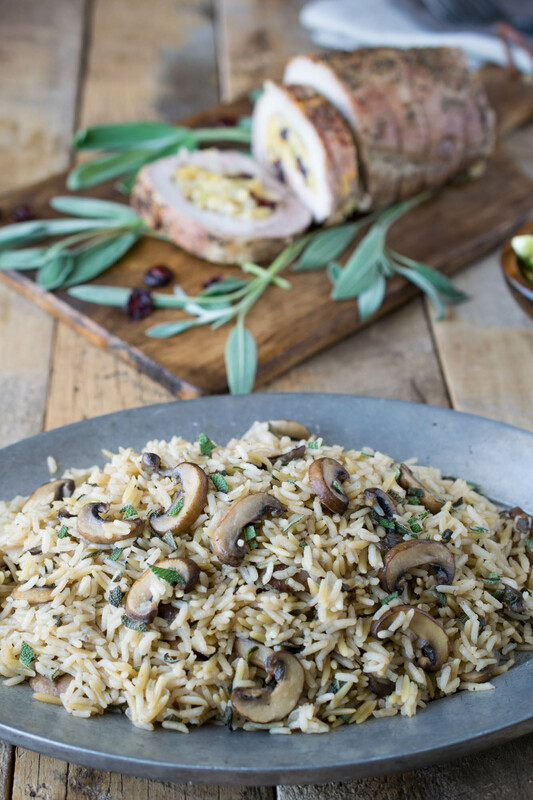 Amazing flavors and tastes going on with this pork tenderloin! Very nicely done, Janette!! Would make a great Sunday supper.